Controlled timed-release profiles to separate release of incompatible materials. Controls chemical interactions between actives. Could increase number of new drugs brought to market. Allows different excipients used in single dosage form. High potency and low dose solutions. 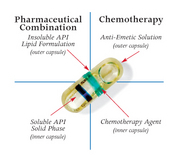 Water soluble and poorly soluble drugs delivered in single dosage form. Reduced migration associated with softgels. Finished product is less sensitive to heat than softgels.